DAY 26 - 30DaysOfAvoToast: Middle Indian - AvoSeedo - Grow your own Avocado Tree! When you think of quintessentials in Indian cuisine you should think of turmeric and sesame seeds. Both ingredients play a large role in typical dishes and so we had to have them play a role in this AvoToast. As for a good ingredient to complement, chorizo was a top choice for its texture and taste combo. Preheat skillet over medium heat. Put one tablespoon olive oil into the pan and add the chorizo. Cook for 5-7 minutes until crispy. Put chickpeas, garlic, tahini, turmeric, lime juice, salt and 2 tablespoons olive oil into a food processor and process until it is minced. Add some water or chickpeas liquid until you like the texture. Cut avocado into thin slices.. 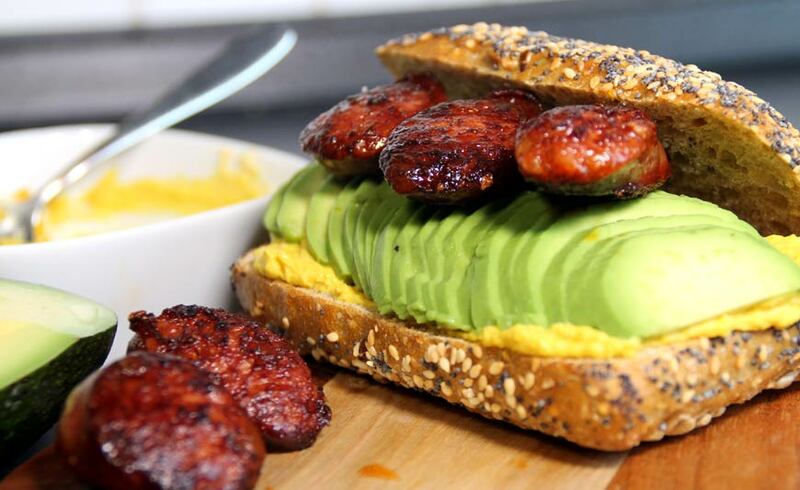 Put hummus, avocado and grilled chorizo on one half of the whole grain roll. Season with salt and pepper. This entry was posted in Recipes and tagged Avocado, avocado toast, chickpeas, chorizo, garlic, hummus, lime, olive oil, tahini, tumeric.